I came a across a very nice correspondence in the Bhaktivedanta Archives, in a collection of all the letters written by my guru, Srila Prabhupada. This is my last post for the year. Wishing you all a wonderful 2008. Please accept my blessings. I am in due receipt of your letter dated July 25, 1969, and I have noted the contents carefully. I am pleased to learn that you have become interested in Krishna Consciousness through living at the Krishna House in Montreal and associating with the devotees there. Your return address is not at this Krishna House, and I hope that you are attending the Kirtanas which are held at the temple on Monday, Wednesday and Friday evenings. The chanting of Hare Krishna Mantra will clear away all of the difficulties that you have mentioned. Actually, as pure spirit soul, there is no difficulty; the cause of all problems is that we are forgetful of the fact that we are part and parcel of Krishna, and we are trying to enjoy the material nature through these material bodies. But the laws of material nature are so stringent that in spite of all attempts for enjoyment, the living entity in the material world must always come to the platform of suffering. This chanting of the Hare Krishna Mantra is especially recommended for chanting in this age of Kali yuga so that any sincere soul who takes to it will very soon regain his memory of being the transcendental loving servitor of the Lord, or Krishna. meat, therefore we also do not eat meat. The fruits, grains, and vegetables which we offer to the Lord are not caused any suffering by our offering them to Krishna. Rather they are greatly benefited because to be offered for the pleasure of the Lord will grant for the living entity within the plant body certain liberation in the near future. Everything that we do in Krishna Consciousness is ultimately beneficial to all living creatures because we are working under the recommendations of the Lord Himself who is the well-wisher of all His part and parcel children. I hope this will sufficiently clear up this matter for you. Saturday was spent in Perth’s fashionable suburb of Floreat, at the home of Heidi and Darren. Heidi had invited a group of friends and relatives to attend a cookery class/lunch, and I was to be the facilitator. I tried out a new recipe, Pineapple Kosumalli. Basically this was a pineapple salad, folded with mint leaves and fresh coriander, a little salt and lime, and dressed with a fried seasoning of oil, mustard seeds, curry leaves and green chilies. It was a winner! It’s the peak of pineapple season in Australia, and there are some very sweet specimens appearing at the markets. We showed the crew the special spiral-cut technique that removes all the eyes of the pinepple and also makes a decorative design when the fruit is opened. The fresh spinach and panir cheese cooked in a homemade spice paste and folded with double cream, Palak Panir, was a success as usual. Western Australia’s sweet and butter-soft Ord River chickpeas, the best I have ever tasted, formed the basis of our Bengali Chickpea and Cauliflower Curry. Talking of Western Australia, yesterday also marked the date of what might well be my last class in Western Australia. I have new plans afoot, but there is time separating my disclosing them. I think it was the sage Chanakya who recommended that a gentleman not disclose his agenda before it is executed, lest it be spoiled. I’ll let you know what’s going on in the next couple of weeks. Rickie Chang from Singapore wrote me this morning asking about Baharat. He or she (sorry, not sure) told me how hard it was to track down. I explained that it’s better to make your own anyway. 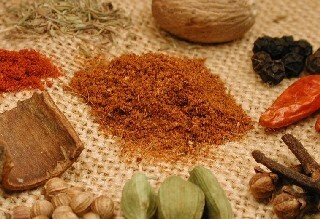 ‘Baharat’ is the Arabic word for ‘spice’, (based on the word ‘bahar’ meaning pepper). It is sort of an Arabic garam masala if you like, an all-round hot-sweet spice mix. Here’s my favourite homemade baharat spice, plus a few others. I tend to make small amounts. Fresh is best. Dry roast the first 6 spices over low heat in a heavy frying pan until they become slightly darker and aromatic. 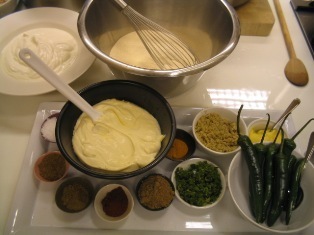 Grind them in a mortar or electric spice grinder. Combine with the nutmeg and paprika and store in a sealed jar. Makes about 3 tablespoons. And for those who thought that adding/not adding salt in bread was an insignificant choice, think again. Read this interesting article. My response to people who ask me such questions is: ‘Tell me more details of the recipe you are referring to.’ Put the responsibility back on them to explain. Get them to describe to you what they are talking about. Dhoodh is the Hindi name for milk, yes. Maybe they are confused and thinking of something else, like dhoodh pak, for instance (a sweet made with milk). If they actually do just want a recipe for hot milk (garam dhoodh), tell them all the different things you can add, like cardamom, saffron, turmeric, nutmeg, sliced pistachios, almonds etc, plus, of course, a little sugar. Hope this helps. Tommaso from Verona, Italy writes: “I recently tasted a nice salad of mung bean sprouts and potato on my trip to North India. It was healthy and very tasty. Can you send me a recipe? Hello! Yes, sprouted mung are indeed very healthy! I love to make my own. You won’t get them as long as the ones you buy at Asian markets, but short-tailed homemade sprouts like the ones pictured above are bursting with juicy succulence and crisp nutrition. How’s that for a mouthful! You can sprinkle them in salad, eat them straight with a sprinkle of sea salt or Indian black salt and a squeeze of lime juice, or cook with them. Here’s a delicious favourite recipe of mine that includes sprouts. road-side snack in India, especially in Delhi. The chili, lemon, and tongue-tingling spice combination chat masala give it a pleasant bite. 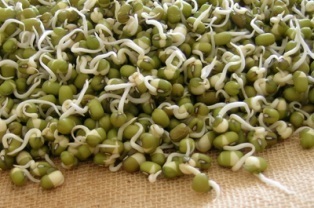 Home sprouted mung beans taste best. Serves six. In life’s big cricket match, today I’m 55, not out. Yes I know, there has been a bit of silly mid-on; and although I have been caught-out more than once, I’m confident of reaching the next Boxing Day Test. My partnership average has been poor, and with all those sticky wickets, I’ve almost been bowled out on a number of occasions. Fortunately there’s more than one innings, so my batting average might get me through. Hopefully, when I reach Life’s Final Test Match, I won’t be stumped. Aaaargh! Christmas is upon us again.